Do you want to know how to make the PERFECT pork chops? Ever wonder how to cook pork chops in the oven? 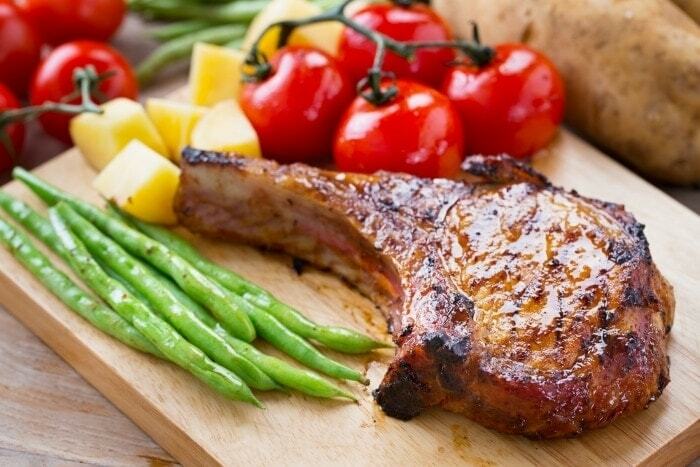 Here’s a recipe for quick and easy pork chops that you’re gonna love! With just a few easy steps, you can be on your way to delectable pork chops. Part of the secret is using brown sugar. The taste of brown sugar baked into pork chops brings out the natural pork chop flavors and is absolutely amazing! This recipe uses bone-in pork chops, which are preferred by many because it is often more flavorful, juicy and tender. Pork chops can be grilled or pan fried, but this recipe is as easy as it gets and bakes right in the oven with little effort. There are all sorts of ways to cook pork chops, different marinades to use, etc., but this recipe will give you the basics of how to make a delicious, bone-in pork chop right in the oven. The perfect easy pork chop dinner recipe for two! If you need to make more than 2 pork chops, please increase the time to cook, you’ll also need to make more rub too. Never increase the temperature when cooking meat! You will cook the outside too much and leave it pink in the middle, how long to bake pork chops for? Well, the average cooking (for Medium size pork chops) time is 30 minutes, and for each extra pork chop you’ll need to add 8 minutes more per side. Eg. Four pork chops would need 30 minutes per side, be sure to check on them as each oven is different. I recommend using a stove oven with a solid air circulation system. Coat both sides of pork chops well with salt, pepper and brown sugar. Rub it in good. Place coated pork chops in baking pan and cook for 15 minutes on center rack of oven. Turn over and cook an additional 15 minutes for a total of 30 minutes cooking time. Remove from oven and let pork chops rest on a plate for about 5 minutes before eating. Love short ingredient lists! These look delicious. Can’t wait to try them! Can I do this in a casserole dish and keep covered? Or do I use a cookie sheet with foil down? Sorry I’m new to cooking! Depends on the thickness of the chops! Always check internal temp before serving to be sure to get the best results. Yes, 6 pork chops should be all baked in a preheated ovem; at 345degrees F.,– and should be done in 35 minutes & sll bsked, –&,certainly ready to enjoy! From some of the comments, it appears chops should be seared prior to baking. Should I apply the rub BEFORE or AFTER searing. Also, if I sear the chops, should I bake covered or uncovered?? You don’t need to cover them. This is why they will not crisp up. If you do cover them you are then not just cooking them you are actually steaming them at the same time witch in turn shortens your cooking time. Hope this helps you. If the recipe doesn’t say to cover them, then don’t cover them. I made this for my boyfriend and I. He is a huge food critic and he LOVED it. He even picked up the bone with his fingers so he could chew all the meat off. It’s so simple but so good! This will be an easy “go-to” for me. I only have boneless pork chops. Can I still make this? Or is there anything I could add to still be able to use this recipe? Thank you so much!! Super easy, very tasty. My belly thanks you too. I used 2 bone in apx 1-1/2 thick center cut chops. Followed the recipe except no black pepper (hubby can’t have) came out very good! I will make these again! Omg! Thank you as our family loved it..even my little picky eater was a fan of this recipe. Try basting with honey about 15 mins b4 they are done, flipping and repeating other side half way thru the last 15 mins. Helps with carmelizing too. Very yummy. Was great! I will be making this again! Made these a few days ago. They were delicious. Didn’t do the rub just regular seasonig. Loved them! Thank you so much. Made this for my family. We have 3 boys all under age of 9. They gnawed on the bones like cavemen. My go to bone in pork chop recipe. Cover it for most of the baking time and if you like it crispy just uncover it for the last 10 minutes. Do you have calorie, fat gram, etc on this recipe? You know…. I have always made pork chops the way I was taught…. Sprinkle generously with Lawry’s Season Salt then pour some liquid smoke. Even the bone tastes yummy. I am making half my way and half the way this recipe says. We will see what my husband thinks. He usually cooks because I tend to burn myself lately when cooking. LOL. He will never know it’s on purpose. Anyway, I will let you know how it turns out. Equal parts white sugar with molasses…. makes brown sugar. I made these tonight for dinner. Any idea on how many calories in this? Would boneless pork chops work as fine as bone in porkchops? If you like them thicker just keep them in the oven 5 to 10 more minutes. Depends on the degree of doneness you like. Are the pork chops cooked with cover on baking dish? Yes they are covered and if you like them crispy you should take off the cover for the last 5-10 minutes. I’m concerned. Mine are in the oven now, with only 8 minutes to go. Where in the main recipe above does it say to cover while cooking? flavor was decent. I followed recipe and cooking instructions exactly. 1st, not nearly enough seasoning, the recipe will work for one pork chop. 2nd, 325 for 30 min they were still raw, 3rd did not brown/ glaze at all like the picture. Next time I would pan sear at a hot temp then in over at 350 for about 8 min to finish. I should have read this first. I was skeptical of the low temp ability to brown, and I am finding that to be true. I’ll try throwing them under the broiler quicky to brown the tops, next time – pan sear first! Rub in season, sear n then finish in the oven is how I always do chops. These were great. 40 mins on each side or 40 mins all together? I will make these pork chops today with two additions. I will cut a clove of garlic and rub it on the chops before the rub and I will also add half teaspoon of dried thyme crushed. What does it mean awaiting moderation? I have 10 palm sized boneless chops. What is my cooking time? Tried the chops and something was missing. Next time I will add garlic powder and a bit more Guyana dried thyme. Now it’s only 4 out of 10. The recipe looks good and I would love to try it. My problem is I’m waiting to start fdinner and I have them in the refrigerator with a sauce on them from another recipe I got here on line. I have 4 pork chops but they are huge. They take up my whole cookie sheet . I have potatoes waiting to go with it but they may not fit ! I plan to try it. I have cooked they before and used mustard and honey on them. It was super. The good news is I’m done talking !!! Thanks. Would this recipe pare well with country gravy ? Hi, I’m making this tonight. I have 6 bone-in (kind of thin). How long do I cook on each side? Ive got 4 pork chops? What would be my cooking time for each side? I fixed these tonight and my husband said they are the best pork chops I’ve ever made! We’ve been together 17 years! Made 8 bone in chops in oven (had marinated them earlier to grill but was too stormy outside so used the oven). THESE WERE AWESOME! Cover for first 15-20 minutes then uncover for last 15-20 for crispier finish. Will def do this again! Very moist and tender. I cooked these bone in porks.. I cooked 5 of them for 40 minutes per side.. they came out awesome..the only thing I will change is less black pepper in the sauce. I’m not thinking 15 minutes per side at 325 degrees is long enough to brown the chops. Did anyone sear them in a skillet first? I didn’t know I had to cover them darn it I have mine in the I’ve now 10 of them so should I take them out and switch pans? I see nowhere on the recipe where it gives how thick the pork chops were for this recipe. That will make a huge difference for cooking time… thick or thin? Looking forward to reply ad would like to try these tonight. This recipe was absolutely amazing. It was a huge hit with my husband and 2 kids. I made 8 boneless pork chops that were rather thick so I made the time 35 minutes on each side and they came out nice and browned as if they had been seared. I probably could have gotten away with 30 but I wanted to be safe. They were so tender and juicy and the flavor was out of this world. Such an easy and delicious recipe. I will definitely be making this again. I have 3 bone-in kind of thick. What’s my cooking time for both sides? Delicious! I prefer thick pork chops, but my local store only had thin cut tonight, maybe half inch with bone in. I bumped up the temp and shortened the cook time, then hit them with full broiler for a minute or so each side. Very moist! I added a few shakes of chili powder to add a kick, which was perfect. Can I use white sugar? I did this with just two pork chops and 30 minutes was not enough. even with 15 on each side it does not look anything like the picture so I am doing 45 on one side and 15 on another. Perfect! My chops were very thick so I cooked them for a total of 45 minutes (for 2 of them). I had marinated them in olive oil, salt, pepper, rosemary and basil overnight. My first time making pork chops and will happily do them again. Thank you!! Just tried this recipe for my family tonight and they LOVED it!! Excellent recipe! I have made this four times over the past two months since I stumbled upon the recipe. The Kroger by my house always has thick (1 inch +) bone-in pork chops on the clearance meat rack so I have 8 packs of them in my freezer now, just so I can make this recipe. I use light brown sugar, garlic and onion powder, and salt-free Frere Jean’s Cajun Seasoning as the rub, cook for three minutes a side in hot olive oil, then bake for 20 minutes a side in the oven. I’m only cooking two chops. They turn out perfect every time! And the recipe is easy enough to make when I get home from work at 4:30. I turn on the oven and heat the oil when I walk in, change clothes while they heat, then brown the meat and pop it in the oven. My favorite side for the chops is Pict Sweet’s Summer Vegetables with black pepper, which blends nicely with the Cajun spice and brown sugar of the chops. Thanks! BEST pork chops I have ever had!! AMAZING!!!! Double the seasoning, this recipe is only enough for one chop. Many are saying the cooking time is not enough, but I found it to be fine. It will not brown, though; I just broil it for a few minutes at the end. My family loves these, although one of my sons prefers a little less black pepper. The chops were tender and not overcooked. They tasted good but boring because the seasoning did not stay put and the chops did not brown. I made 5, bone-in, medium pork chops (approx 1/2 inch thick) and baked on the center rack in a 325 preheated oven for 20 minutes each side. Seasoning was doubled. I used a sheet pan lined with foil and sprayed with cooking spray. The chops were not crowded. After the first 20 minutes there was no color on the top and it looked like all the seasoning just melted away into the juices in the bottom of the pan. I flipped them and set the timer for another 20 minutes. During the last 5 minutes I took a peak and there was still no browning. They looked like I had not seasoned them at all and the tops were looking dry. I basted with the juices and turned the oven to broil for 3 of the remaining minutes. I flipped the chops, basting again, then broiled for another 2 minutes. 10 minute rest. They still were not brown and looked like gray boiled pork chops. Ok, I am a fairly accompished cook. So I followed the intructions to a T. On 2 bone in Pork chops the rub wa bairly enough to cover both chops. In the oven at 325, preheated, the chops still looked raw at 15 minutes. Now I am at 5 minutes into the second side and they are looking anemic. By the way my oven is calibrated so I know the temp is correct. Will have to finish them in a skillet. Sadly disappointed. No where in the recipe does it say brown in skillet or to cover the chops in this so called “easy recipe”. Saw all of this in the comments while chops were cooking in oven. Not sure if this will turn out but trying. You are killing me here people! no you don’t cover the dish. If your meat was raw gray or in someway unappealing my guess is your oven temp may not be accurate. Use a thermometer in the oven not the type you stick in the food. arrozo, or some other flavor then fix your diner however you want and don’t ask why this recipe doesn’t call for those things. If it did it wouldn’t be this dish. I tried it we loved it, I will make it again in the future. Oops my mistake Neil, I am so sorry I called you a nice lady. Correction this nice gentleman has offered his recipe for your enjoyment . I have 5 thin bone in pork loin chops. I may be able to go with 15 each side for these thin chops. If they were thicker I may do searing and linger time. I tried a similar recipe with butter and honey for a friend decades ago because she had nothing else to use and she loved them. I normally don’t have brown sugar but do now so my recipe will take a back burner. I will do the garlic too though bcz I love garlic. My daughter is the customer this time. We’ll see. Thank you for easy!! THE BEST JUICY THIN BONE IN CHOPS EVER!!!!!! the husband and I LOVED THEM…..Will be making this way from now on. So many comments, and they aren’t consistent with original “easy” directions. Cook covered or uncovered? 325 or 345? 30 mins total or 30 mins per side? I have 8 bone-in thin chops that I’m trying to decide on how to cook. They are on a foil lined pan, seasoned on both sides. Then the confusion starts! Can I get confirmation please? We don’t leave comments on websites. Are you sure about the we cook times.